Pita Pit will open over 50 outlets in India over next five years to expand footprint in the northern and eastern regions to being with. 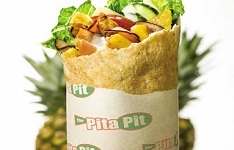 NEW DELHI: Canadian quick service restaurant chain Pita Pit will open over 50 outlets in India over next five years to expand footprint in the northern and eastern regions to being with. "We are looking at opening 50 plus Pita Pit outlets in the country in the five next years," Pita Pit India Chairman Pramod Dhawan told PTI. The company, which entered Indian market in November, operates three outlets in the Delhi NCR region through its master franchisee Mentor Hospitality for North & East region. Dhawan said expansion will be through a mix of company- owned and franchised stores. "We are looking at sub-franchisees to expand operations here. We are yet to finalise on sub-franchisees yet," he added. For store expansion, Pita Pit will open more outlets in Delhi NCR, Chandigarh, Ludhiana and Jalandhar. Pita Pit is yet to finalise a franchisee for West and South regions. When asked if Mentor Hospitality will look at the possibility of signing up with the Pita Pit to open stores in West and South region, Pita Pit Director Anun Dhawan said: "Once we complete expansion in the North and East region we may look at that as well. It will be interesting to look west as well but not in the immediate future." Founded in 1995, Pita Pit has 500 stores in countries like New Zealand, Panama, France, South Korea, Trinidad & Tobago, Brazil, UK, Australia, France and India. It is a privately held company and does not share financials.